Thanks to Kim Klassen for textures: thursday, autumnburst, and 123. I love sweet, juicy pears! Yep, you guessed it. I'm on a macro journey and food seems to be a good subject. I stopped by my former husband's last night on my way home from work and since he grows all kinds of fresh fruit and vegetables, he offered me some pears. They have way more than they can eat, so I am a lucky beneficiary when I take advantage of it. 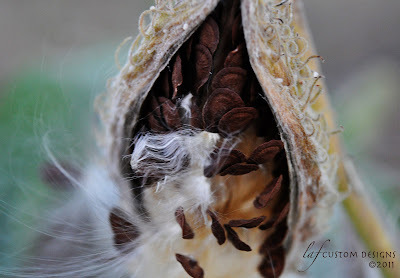 As I began my journey playing with my new extension tubes yesterday, this was one of the first photos I took. I looked around my kitchen for a subject. First, I tried the writing inside my Caribou Coffee cup, "Life is short, stay awake for it." Then I tried a simple subject, the utility bill--just to see if I could get the hang of focusing properly with the tubes. But when I noticed the yam that never made it down the disposal but still sat on the plate on the kitchen counter, I was intrigued. I put it on the table, took a few shots, then saw the sunlight shining through the arcadia door. That was it. I moved my remnant yam into the light and voila, there you have it--a stalagmite of yam! This conjures up an amusing series of abandoned food. I think this yam made for a beautiful specimen. Having fun with extension tubes. I went on a stroll with Kobi this afternoon and spent some time practicing with my new AF extension tubes. I got some interesting pics, but this is today's best. No textures, just a bit of blending mode and layer adjustment. 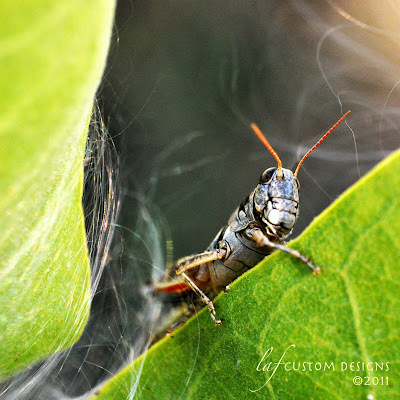 This grasshopper was munching on a the leaf of a milkweed pod that had gone to seed. It is the latter that actually caught my eye. In fact, using the extension tubes, I was quite close and it wasn't until after I snapped the first couple shots that I even noticed this little fella. I'm quite surprised he didn't just skedaddle long before I noticed him. While I was capturing this beauty, Kobi took a quick dip in the creek across the path! 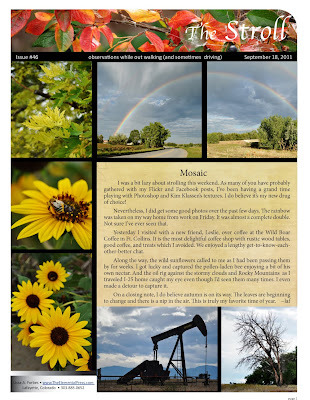 Here is the September 25, 2011 issue of The Stroll: Observations While Out Walking (and sometimes driving). 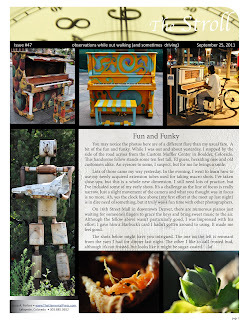 Lots of fun and funky in this issue from painted pianos in the street to a muffler sculpture and first efforts at macro photography. Thanks so much for taking time to smell the roses and enjoy the unusual and intriguing. I'm rarely in Denver at night, but never out walking about so the 16th Street Mall was a new experience for me. I so enjoyed the funky painted pianos where anyone could sit and play on a whim. This fellow wasn't particularly good, but I enjoyed his efforts. In fact, I found myself feeling benevolent and gave him a $10 Starbucks card I had on me. It's quite amazing the effect giving has on me. Coupled with my discovery of new art, I drove home feeling in love with life again. Now, that my friends, is an accomplishment. I've been playing with more photos since I got home two hours ago from my macro lesson in downtown Denver. I still need some practice with that new skill, but in the meantime I got some nice night shots. Now, who knew we had a World Trade Center here in Denver. Maybe I should get out more! Love the sense of hopefulness I get from this photo. Textures thanks to Kim Klassen: Thursday and Serious Magic. This is an iconic figure in Boulder, Colorado. Muffler Man stands outside the Custom Muffler Center inviting people to stop in and get their mufflers fixed. He also brings smiles to passers-by. And I'm guessing is an eyesore to some. I think it's a creative piece of advertising and use of recycled materials. Hover your mouse over image to see "before" image. I wore these shoes to work yesterday. They make my feet happy! They make me happy. The story behind the life of these shoes is a bit sad, but they occasionally get to come out of the closet and really live. Sixteen years ago my youngest son (now 26) and I went to a craft fair where a young man had his handmade shoes on display. Scott pick out this pair. Because they were very expensive and I was a single mom needing to keep reins on my budget, I asked him if he would wear them. He assured me he would. He was soooo excited about them and I believed him. Unfortunately, he only wore them once. Why, you ask? Or can you guess? Well, he wore them to school that Monday and came home feeling as funky as the shoes, but in a different way -- dejected. You guessed it, the kids at school made fun of him. It was hard to convince him at that age that it didn't matter what others thought, but what was important was to follow your own music. If I had one message for him now it would be to pay attention to what makes him happy and do it regardless of the judgments of others -- with one caveat -- that he's not hurting anyone. Given the fact that he has long outgrown these shoes, and even though they are a bit too big for me, I love giving them new life and that they reciprocate by giving me joy! When have you been discouraged by the reactions of others? Do you retreat? Or do you stand tall? Go out and live life in all your brightness!! My colleague at work who knows I love cool photo opps called me into his office to see this leaf bug outside his window. So of course, I ran to get my camera, went outside, and snapped away. Couldn't wait to get home to texturize! If you've seen this on Flickr, what I didn't share there are the before pictures. Wanted to show just how boring those pictures were. 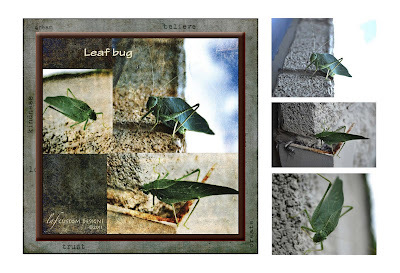 Also, it was an odd place to find a leaf bug--on a cinder block wall! As you can see I got several different angles, one with the sky totally washed out. Now, if I'd only had a macro I could have gotten this little guys' big googly eyes much better. I learned about AF extension tubes for photographing macros a couple weeks ago and ran right out to get some. Without any instruction, I was messing around with them, took a picture of my keyboard in low light. Not a great picture. I'm so glad I'll be attending a Nikon Meetup this Saturday so I can learn more about how to use the extension tubes properly. In the meantime, it felt like a perfect photo for experimenting with Kim Klassen's new ugglove textures*. I think they made this little gal a perfectly grungy, used, and loved MacBook V key. It's only fair that I give my computer a bit of recognition since I spend so much time with her. Next to my puppy dog, I don't think I have a more intimate relationship! So sad. Maybe I should get out some rubbing alcohol and treat her to a cleaning up. But, then she may have trouble breathing for the fumes. I'm not so sure being clean is her top priority, but having her keys caressed probably is. 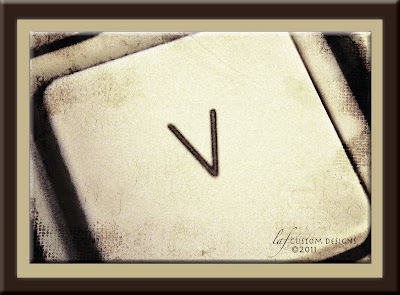 I wouldn't be able to process my photographs or write amusing essays if I didn't have my very used, very ugg, very loved V key. 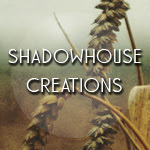 Kim Klassen has opened up a whole new world of creativity for me with her textures and her Photoshop Essentials course. She is the gentle guide you always wished you had to learn anything, but Photoshop and her unending talent for creativity is her specialty! * Used all three of Kim's ugglove textures at different blending modes and percentages. Here is the September 18, 2011 issue of The Stroll: Observations While Out Walking (and sometimes driving). I seem to walk through life these days seeing the world in 1” squares as though always looking through a camera’s viewfinder. This week I found interest in simple things. And I’m enjoying watching fall roll in. Thanks so much for taking time to smell the roses and find the extraordinary in the ordinary. 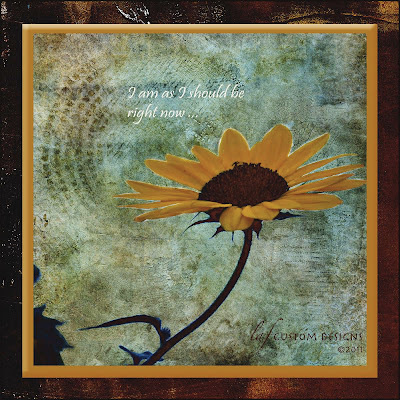 "I am as I should be ..."
More of Kim Klassen's textures on sunflower. I'm sure those of you familiar with her autumnburst recognize it now. I think I've gone a bit crazy today! But I had fun with this one. 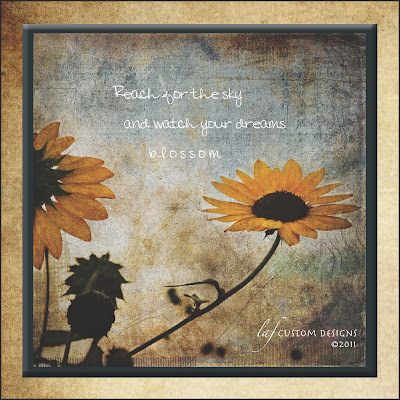 Reach for the sky and dream. It always comes down to that, doesn't it? I've seen the giant oil rigs along I-25 between Lafayette and Ft. Collins before, but today they called out to have their picture taken with the storm clouds in the background. 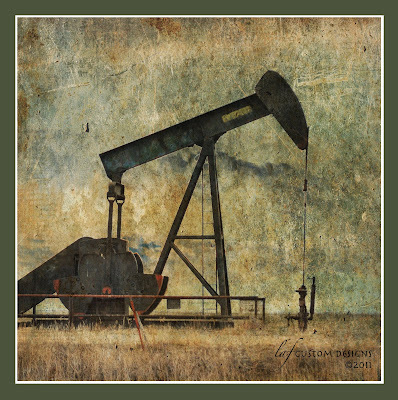 In the original photo the Rocky Mountains can be seen, but I just love the effect created by using grungetextures.com's corrosion on old metal (Overlay at 68%) and Kim Klassen's faved (Overlay at 33%) and a background duplicate (Exclusion at 100%). I've noticed clusters of wild sunflowers beside the road for weeks now. Today, I finally stopped to get a closer peek. 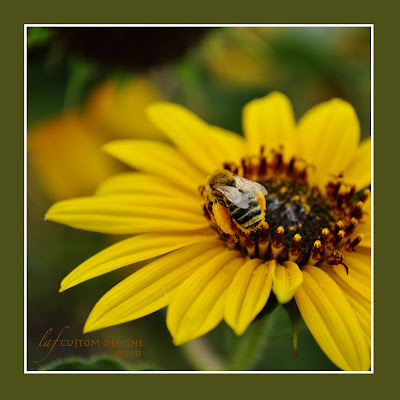 I was thrilled to see the bees drinking sweet nectar and delighted when I got home and saw the crisp clarity of this one's body and pollen coated legs. I am always amazed at the captures I get at unexpected times. 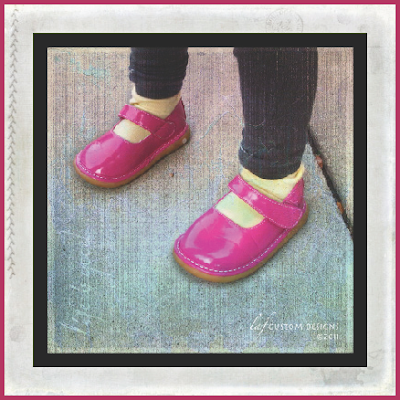 You see, if I hadn't stopped at the grocery store for breakfast on my way to work yesterday, I wouldn't have encountered a precious little girl (about 3 years old) wearing hot pink shoes that squeaked with each step she took. Almost passed by with only the smile on my face and turned around to ask her mom if I could take the picture--with my Blackberry. I couldn't wait to treat the picture with Pixel Dust's textures Life is Good and Silken Waters and frame it with Kim Klassen's If Only.